How do I set up development and production environments? Legalesign supports prod and dev environments through its teams. Almost all Legalesign's document, signing and sending features occur within teams You will be running everything through one team or another. You can assign one group as your 'dev' or 'API' group, and another as your production group. Configure your first group as an 'API group' to set it as a development environment. This means, for example, you get a shortcut link to the API docs. Running document tests through your development group does not incur additional cost. Tell support which group is your development environment to make sure you dev testing does not go into your billing. Whether a group is 'prod' or 'dev' is not the same as the sandbox. Sandbox is a limitation on your whole account while you prototype your app. You are removed from the sandbox when billing is set up. 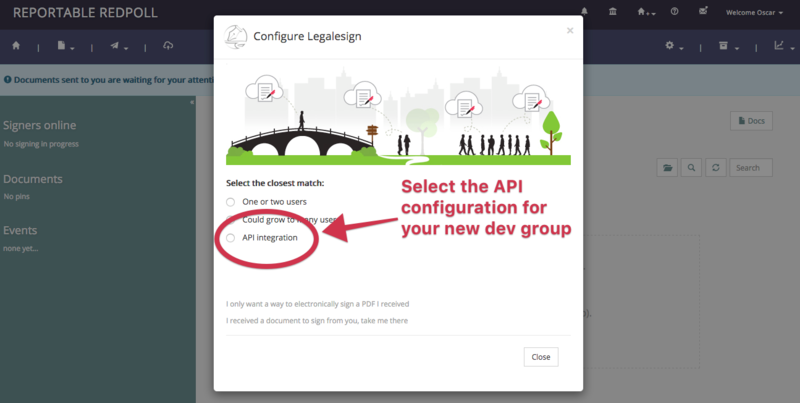 When you first create a group you can select to configure it for API development. This will create a group that is suited for development. Along the top of the page you will have a link to your own API documentation (which will be personal so you can cut & paste code) and you will also see an option to "Create a production container". This will create a new group with a normal configuration you can use for production. If you change your mind about which groups you want to use for development and for production just let support know and they will re-assign them. In your code you refer to a group using its resource uri, which follows the usual API format, '/api/v1/group/your-group-name/'. All of your groups and their resource uris are listed in your custom API docs (at the top of the right hand column; make sure you go to your custom API docs linked from within your development team). Click here for more information about the API documentation.